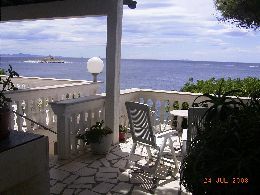 Apartments Novak- Hvar, are situated on the south-eastern side of the town of Hvar in the pine wood and by the sea. The nearest beach, Pokonji dol, is some 500 m away but our guests can swim and bask in the sun in front of the house on the flattened rocks. The family house Novak has 8 apartments/studio. The terraces of all the apartments face sea, overlooking high seas and distant islands.Each apartments/studio has got a air condition, satellite TV, small kitchen and bathroom. Towels and sheets are included in the price. Apart from the 3 star quality accommodation, offer 2 boats for rent of 4,5 and 5 m with engine of 5HP. It is also possible to get breakfast, dinner, home made marmalade,honey, olive oil, brandy..... and all needed information about town Hvar---our Adriatic pearl, island Hvar. In the price is include cost of gas, water, air condition, towels, bed-linen and the tax.